Thinking about castors gave me an idea... A small jack and four small steel plates with castors, each plate the size of a car tyre's footprint, would make a very simple kit for moving a car from in front of a dropped curb... Once the car is rolling it could be pushed anywhere. Does that make it my problem to find a new legal parking space. No need to make your own Graeme. Just buy them here for £54 a pair. Or for maximum ease of use buy them with the jacks built in. Oh what fun we could have! 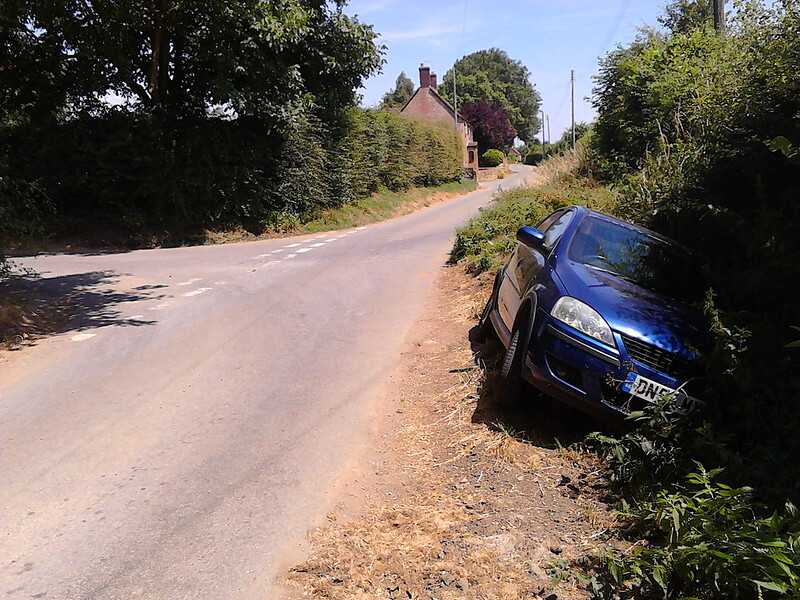 I'm not sure if this has been parked in the ditch, reversed into it, or crashed in a remarkably neat manner. It seems to have reversed in, so probably not the last, but who knows? I'd say "stolen abandoned" except it's right outside a farm house. This is a mixture of crap cycle facilities and people who park like fuds. The lane is all over 2m long (although it leads to a shared use footway) but is often used as a teeny parking bay. We've got one of those, but bigger. It functions as over-spill wankpanzer parking for when good weather causes half of Birmingham to drive to the park and/or cricket is being perpetrated at Edgbaston. The bollocksinfra quotient is enhanced by several strategically positioned potholes at the point where you have to execute a confusing (to motorists) right turn to join the path. The usual method of ignoring crap cycle infrastructure entirely is contraindicated by it leading to a useful (for stopping the endless flow of cars) toucan crossing. If you scroll back through time you can see that prior to becoming a luxury parking space, that bit of pavement was once home to a portacabin, and a glitch in the space-time continuum. But, that is a red car. Parked EXACTLY as is shown on the sign! I presume that sign means such diagonal parking is prohibited but can see how it might purportedly be interpreted by those looking for excuses. Moving-in day for new students. Unfortunately they brought their imbecilic parents with them. Someone needs to remind the parents (and enforcement body) that the double yellow lines restriction extends all the way accross the pavement to the building line. I do hope there was an enforcement type gadggie waiting nearby as a puschair pushing mum or wheelchair propelling pedestrian failed to negotiate the pavement and had to take to the road. No, I am NOT holding my breath. In shock news, only three brief years after I asked Surrey Highways about double yellow lines on the corner by my house, someone has marked out their position with spray paint on the curb. I think it takes a long time to get yellow lines approved, because democramonster. Though it shouldn't take three years. What can be done without procedures is painting white "keep clear" lines, because they don't have legal standing. It's Surrey, despite being one of the most affluent parts of the UK with a high council tax, they still seem to be unable to do anything. We do have well compensated executive leadership team and nice offices in Kingston. If you ask anything of the council they're basically: well we could fix that big hole in your road, but eight old people will starve in one of our homes, so come on, which do you want? Dead Grandmas? So anyway, you have to persuade the council, get the backing of the police, then it has to wait for the traffic regulation committee (which seems to meet precisely once a year), and then if they agree, it has to go out to consultation, and finally if there aren't objections, someone comes to paint the lines. So, yes, three years and we're close. It's not without irony that I'm sure it's actually illegal to park on a junction anyway. It's definitely stupid to do so a t-junction between two narrow lanes at the top of a 25% hill. Go and spray "OXBRIDGE REJECT" down the sides of all the wankpanzers. Objection: Oxbridge rejects go to Durham. Brizzle was *built* by an Oxbridge reject. It's definitely stupid to do so a t-junction between two narrow lanes at the top of a 25% hill. Less stupid than doing the same at the bottom of a 25% hill though. In my day the canonical Oxbridge Reject repository was Exeter. And imperial, well over 50% of my year had applied to Cambridge. Well, one car started at the top and ended up at the bottom (or near enough). Estate agent (quelle surprise), parked not just on the corner but on ice. We saw the car slowly slide past. He was lucky we'd gritted the road itself or his car might have ended up in someone's front room. The bottom road is busier so while people park on the double yellows, they don't do so on the corner itself. That said, for the first time ever (to my knowledge), all the miscreants had been ticketed a few weeks back, which seems to have temporarily discouraged the practice. Tbh, not many people park on the t-junction as it's obviously stupid, but it appeals to the 'just here for a minute' or 'there's nowhere else to park' brigade, there's only been one chap who thought it would make an ideal regular parking place until the police turned up to point out otherwise. If someone is parked there nothing big can get around the corner – which would include fire engines.